Bio: Decepticon Doubledealer doesn't really care whom he works for, as long as they can pay his fee. And pay they do. The amount of firepower he carries more than makes up for the fact that he's totally untrustworthy. He carries enough explosive power with him to shatter mountains to dust, and for that the Autobots and Decepticons are willing to pay dearly, handing over crates full of Energon chips in exchange for a single battle's worth of services. 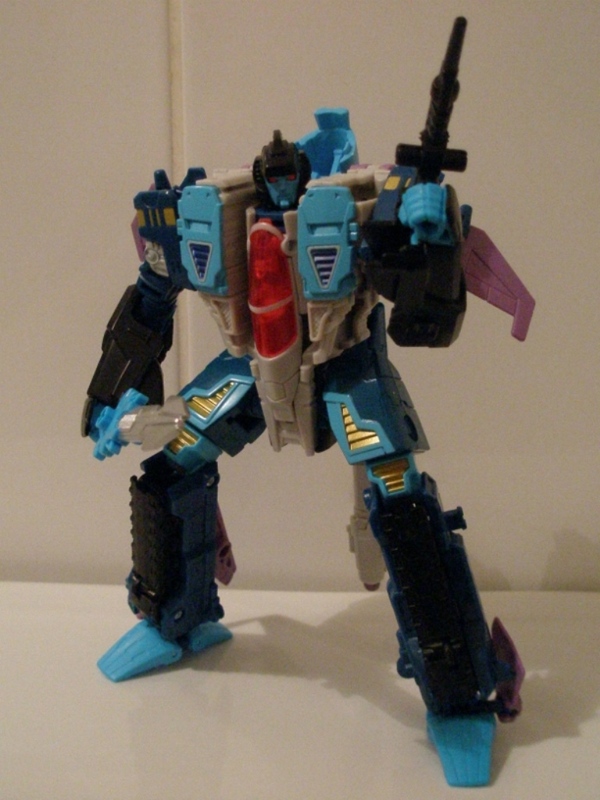 With a protracted and messy war like the millennia-spanning battle between the Autobots and Decepticons, its a wonder there aren't more mercenaries like Doubledealer. The guerrilla fighting and pockets of resistance fighters and dictatorial regimes that litter Cybertron seem ripe for exploitation by the canny operator or private security firm. Still, here he is, the one man army feted by both sides. This wasn't always the case. Back in ye olde days of the Marvel Comics and the Transformers original outing, Doubledealer was portrayed as something of a double agent, in much the same way the Autobot Punch/ Counterpunch was. His Autobot and Decepticon personas were kept hidden from either side. These days, that pretense is pretty much abandoned. His faction symbols are just an indicator of whom he's sold his services to this time. 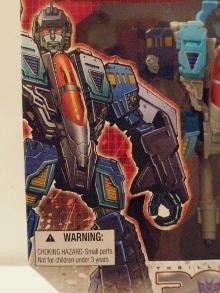 In real terms, its simply because his new Generations toy is minor retool of the mould originally used for the new version of Bltizwing, but its nice to think in terms of the fiction and perhaps his cover being blown as the result of some suspicions from either side. At the very least, someone might have thought that perhaps Double and Dealer (sheesh) share more than just a colour palette. For my money, the Generations ethos of updating 'classic' characters is at its best when revisiting the cast from 1986 up. Even with modern toy engineering, the all plastic Generations versions of say, Prowl or Jazz simply can't compete with the intricate, detailed die-cast and chrome of the original toys. Guys like Doubledealer, whom came later and had to put up with a pretty crude plastic chisel, definitely benefit from the advances in toy engineering made in the intervening years. And so it was that I came to plump for Doubledealer over mould-mate Blitzwing. Somehow, its much more refreshing to see a less familiar face brought up to date, than yet another character whose trademark has been retained to the extent that there are a plethora of toys from different iterations of Transformers available. Well, that and I didn't like Generations Blitzwing cribbing some of his design from the Animated version (whom I class as a totally different character divorced from the original) and Kapow had Doubledealer reduced. Alternate Mode: The jet is the better of the two alternate modes. Doubledealer originally coming from an era when Transformers designs were pretty fanciful carries off this sort of Y-Wing design without it looking goofy. 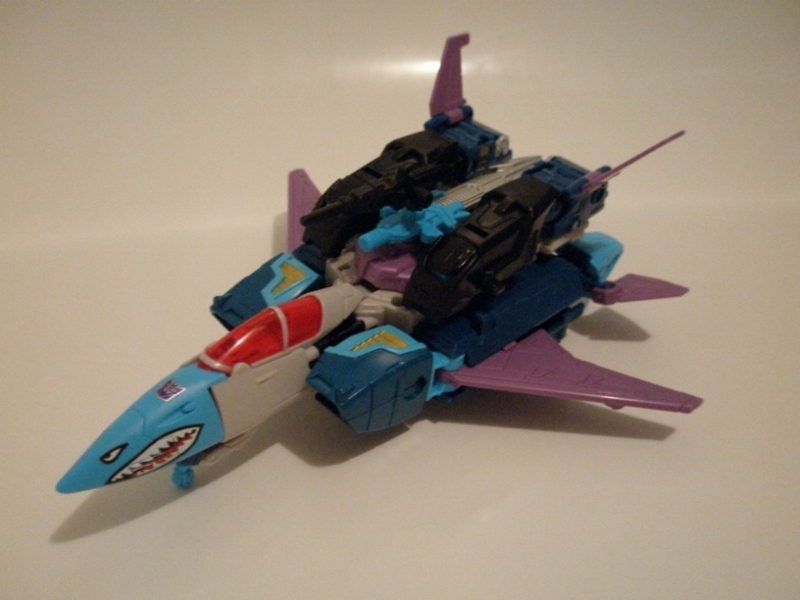 The painted shark face on the nosecone is great and the detailing is lovely. I love the big dollop of marmalade that is the cockpit, although attempts to make this an opening cockpit shouldn't have got past the drawing board. Elsewhere, a bevy of panels and air intakes run all over the bodywork to pick out some detail. The tank turret does a passable impression of an afterburner (if you squint) and only the slightly reedy wings really let this mode down. 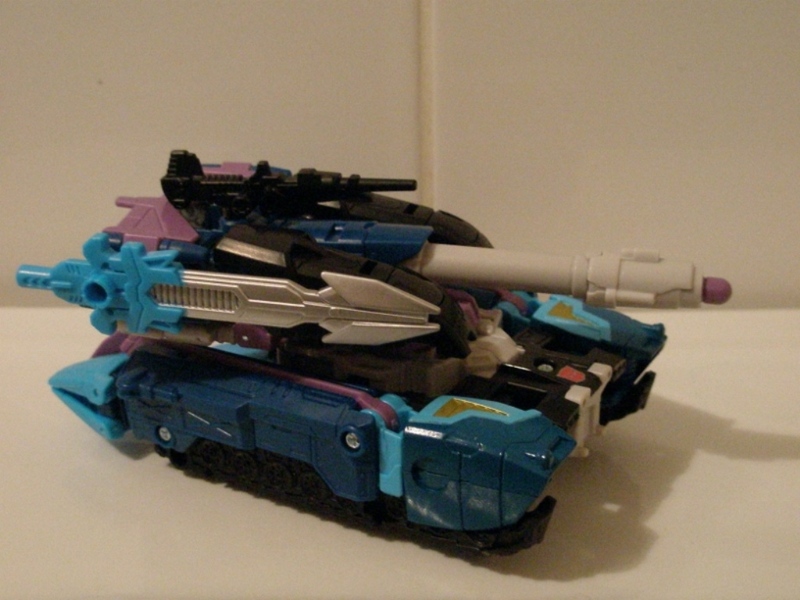 The tank mode reminds me a bit of Sixshot's ramming tank effort. Its a bit of a patchwork of parts and colours and doesn't convince as an actual tank of any kind. The turret is preposterously large compared to the body of the thing which only highlights how half baked this mode is. It rolls nicely enough though. Neither mode incorporates the robot mode weapons to any great effect, with them just looking equally silly wherever you clamp them on the tank or jet. The use of the different faction symbols on the alternate modes somehow doesn't feel as convincing as the two different robot modes did on the original toy. Its difficult to imagine that different alt modes would affect his dealings with either side of the Autobot / Decepticon divide. Basically, whilst a nice touch and homage to the original, they're pointless daubings. 7/10 for the jet, 5/10 for the tank.